The most dramatic scene in Hamlet for me was definitely Act 5 scene 2, which is also the last scene in the play. There is a lot that happens in this scene and it ties up all the loose ends at once in a very well written and exciting fashion. Shakespeare brings everything to an end in a way where you can't help but want more. Six out seven of the deaths that occur in Hamlet (if you include Guildenstern and Rosencrantz) happen within less than four hundred lines of each other so it is a very action packed scene as well. The scene opens with Hamlet confessing his plans to Horatio about how he escapesd death in England and returned and how he has left a letter that will cause the death of Rosencrantz and Guildenstern but he does not show remorse, as they were more than happy to bring him to his death because the king told him to. "They are not near my conscience. Their defeat does by their own insinutation grow" The idea that Hamlet would cunningly switch the letters so that they would die would make this scene exciting enough on its own but this is only the beginning and in comparison to the other things that happen this is nothing. Hamlet does, however, ask if he is justified in killing his uncle considering all the things he has done and tried to do. "Is't not perfect conscience to quit him with this arm?" Hamlet causes a scene when he makes Osric (a courtier) remove and replace his hat a couple of times due to confusing him with wordplay. There is also a cause of drama when Osric tells him that the king wishes for Hamlet to fight Laetres in a duel using rapiers and daggers so that they can put an end to Laetres anger and wish for revenge against him. Both Hamlet and Horatio are very suspicious of this and Horatio tells Hamlet to be wary and keep an eye out for any tricks." If your mind dislike anything, obey it." This adds suspense to the scene, building on the excitement from Hamlets confession earlier. The fact that Hamlet agrees to the fight also adds to both the tension and the excitement.of what is to come. From here on out in the scene, the drama skyrockets into unproportional amounts. This is what the entire play has been building to.Claudius, Gertrude, Laertes and others enter for the tournament. This brings you back to the idea of a show within a show, which was how Hamlets plot for killing his uncle was shown, and also how his guilt was proven. This theme runs through the poem a lot and now for all intent and purposes, the show is about to begin. Hamlet speaks to Laertes, asking his pardon for the offenses Hamlet has committed against him. Laertes says he's unsatisfied by Hamlet's words, but will put aside their differences until a more appropriate time. However Laertes doesn't plan on letting Hamlet out of this alive. Laertes looks for the weapon with the poisoned tip which was planned ahead of the battle between him and Claudius to make sure that Hamlets wounds are fatal. Hamlet doesn't know of this little secret. Claudius drinks a toast then vows to toss poison into the cup for Hamlet if he makes the first or second hit, so that if Hamlet wins, he will be poisoned by the drink. "if Hamlet give the first or second hit...... an union he throw"
The tension is hoisted up another notch when Hamlet scores the first hit and Claudius, true to his word, poisons Hamlets drink. He offers it to Hamlet but Hamlet declines, prefering to get the fight over and done with. The hero narrowly avoids an unknown danger. "I'll play this bout first, set it by awhile" However Claudius doubles the amount of poison in the cup when Hamlet lands another hit on Laertes. Yet again, Hamlet refuses to drink. Instead, his mother drinks in his honour, confident now of hsi victory.Claudius tries to stop her but doesn't make it in time. "It is the poisoned cup. It is too late." The tension in this play is near breaking point at this stage. 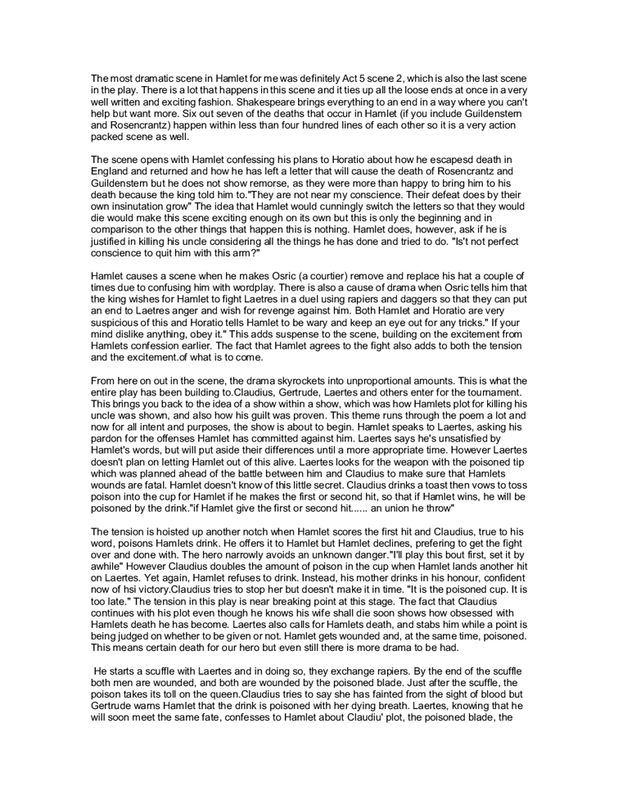 The fact that Claudius continues with his plot even though he knows his wife shall die soon shows how obsessed with Hamlets death he has become. Laertes also calls for Hamlets death, and stabs him while a point is being judged on whether to be given or not. Hamlet gets wounded and, at the same time, poisoned. This means certain death for our hero but even still there is more drama to be had. He starts a scuffle with Laertes and in doing so, they exchange rapiers. By the end of the scuffle both men are wounded, and both are wounded by the poisoned blade. Just after the scuffle, the poison takes its toll on the queen.Claudius tries to say she has fainted from the sight of blood but Gertrude warns Hamlet that the drink is poisoned with her dying breath. Laertes, knowing that he will soon meet the same fate, confesses to Hamlet about Claudiu' plot, the poisoned blade, the drink, everything. "it is here Hamlet. Hamlet.....The king, the king's to blame. Hamlet now knows he has little time left in the world and launches at Claudius, poisoning him with the weapon. "Then venom, To thy work." He also forces the king to drink from the poisoned cup for good measure. Just before Hamlet dies, he announces that he wants Fortinbras to be the heir to the thone. Finally the tension that has been building up for so long, dies down, along with Hamlet, Laertes and the king. Horatio is heartbroken about the loss of his dearest friend. Fortinbras, after being told of all that had transpired, confessed that Hamlet could have been a good king, if he had been given the chance. He tells four captains to carry him off on a stage because it is what he should have been given. "for he was likely, had he been put on, to have proved most royal." 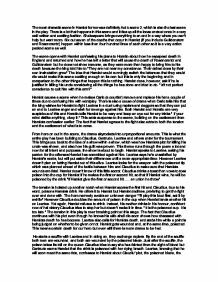 Though it it clear from the candidates introduction that they plan to discuss Act 5 scene 2, this piece of writing has no title, which is a little confusing, you should alway give a title to your work and you should clearly state in your introduction what you plan to discuss, this makes the premise of your essay clear to the reader. Furthermore, without a title is unclear weather or not the candidate has provided enough detail to give an explicit response. The candidate has chosen fairly suitable quotations from the play to add into their essay however for the most part they use these to simply retell the story. When discussing a play you should use quotations to back up your ideas and thoughts, you should be discussing the characters, what are they going through? What are thinking/feeling? How does the quotation you have picked show this? This helps to demonstrate your understanding of the play. Furthermore the candidate has not written a conclusion. You should alway conclude your essay, as this is your opportunity to leave the reader with a good impression of your work. Therefore you should summarise your key points and ideas, you should make sure that your answer your initial question if given one and you should try to give a personal response, your teacher/examiner is interested in what you have to say. The candidate does make a point of discussing the tension and drama within the final scene, however they do not mention the various ways in which Shakespeare uses language to add to this affect, for example the use of short sentences, explanation marks and syntax (the use of questions). Without the discussion of appropriate technical terms the candidate cannot achieve higher than a grade C for this piece of work. In addition to this there are a few spelling errors which could have been avoided had the candidate taken the time to throughly proof read thier work. The audience is told of past events without a narration that can sometimes take away from the play itself. As far as I'm concerned, the main character's thoughts are not always obvious to the audience. For that reason, the soliloquies spoken by Hamlet are directed to the audience, rather than seeming like conversations with himself. Revenge is finally taken in both Hamlet and The Spanish Tragedy, however, while Hieronimo mercilessly pursues revenge and fulfils it in a violent and bloody manner, after he returns from England, Hamlet takes a fatalistic approach to revenge, choosing to 'let be' rather than taking his revenge. The ghost enters and is in a state of purgatory, he can not go to heaven unless his sins have been repented for. Horatio continues to give an account of the spirits which play parts in Rome's history 'Neptune's empire' - the sea. family Polonius and the family of king Fortinbras, with each of the heads of the families dead, due to being murdered by a member of a different family.